These poems are a diaristic portrait of a man’s creative process; the light verses are a gift. 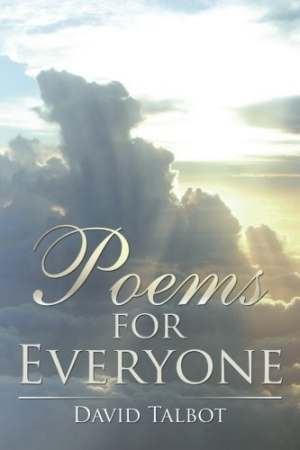 David Talbot’s Poems for Everyone is a topically indiscriminate collection, a volume that reflects one man’s quest to understand his thoughts and feelings through poetry. Throughout this record of his journey, there are moments of surprising levity that feel truly original and special. Talbot’s oeuvre includes light verse, experimental verse, narratives, lyrics, and public voice poems. The work shows a minor shift in style and themes over time: from childhood to war, and from holidays to politics. Poems about childhood move away from his own recollections toward general humorous verses for children, and then to poems written for his own children or grandchildren. The later poems begin delving into some eternal questions: the meaning of life; the nature of the world, faith, and death; and appreciation for the physical world. As a collection, wide variation in style, tone, and occasion makes the volume more interesting as a kind of personal journal, a record of the author’s personal and artistic development over time. Most of the poems end with the author’s name and a date; the earliest poem in the collection was written when Talbot was twenty-nine years old, while the latest poem dates Talbot at eighty. As ordered (alphabetically by title), the poems don’t have a clear narrative arc or sense of belonging together, and the waters are further muddied by several poems appearing more than once. Ultimately, what makes a poem belong seems to be simply its authorship, and the collection is more comprehensive than chronological or thematic. Without context, such phrases seem ephemeral, rather than evocative. Talbot excels at light verse, though, whether in humorous children’s poems, limericks, or doggerel. His preference for end rhymes creates a buoyancy that plays well with his sly humor. Talbot states, “The beauty of writing poetry is that, when you read what you have written, you learn from them”; this is a fair self-assessment of his poems, which often read like discovery drafts. The rawness of Talbot’s verses creates a diaristic portrait of one man’s creative process, but it also often makes the work less accessible for an audience. Among Talbot’s offerings, there may be something for everyone, with his light verses standing as the collection’s gift.